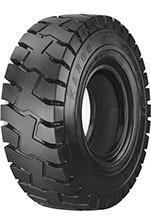 ECOMEGA KARGO is the latest Radial product from the Ecomega tyre line for Port Industrial applications. It is designed for applications and machines like Reach Stackers, big forklifts, Container Handlers and other Container handling machines. This Radial tyre is specially designed for severe applications which face high heat temperature and long haulage. 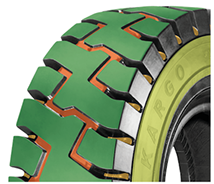 The casing construction, the E4 tread and the particular pattern design assure maximum comfort for the machine and the driver thanks to a silent and smooth ride guaranteeing also the best grip in wet and slippery surfaces. The sidewalls have been strongly reinforced to protect the tyre from lateral damages, and the particular bead profile prevents the intrusion of stones and other debris. In addition to that the particular compound makes this tire very resistant to punctures and cuts.